A year tomorrow, I ran my first (of one) marathons, so it’s about for something new and exciting. My first triathlon certainly has come around quickly! To give you a heads up, and to make me sound like I know what I’m talking about, a triathlon is a multi sport event, which starts with a swim, followed by a bike ride, followed by a run. The bits between sports are called “transitions”, and the bit between the swim and the bike legs is called T1, and between the bike and the run T2. There are many different distances of triathlons from super-sprint, to sprint, to Olympic, to half-Iron to Iron Man distance and beyond, and I’m sure there are many more in between. There are some variations on distances of triathlons, to fit in with the geography of their venue. This one was a pool based Super Sprint triathlon, which is a 400m pool based swim, a 24km (15 mile) bike ride, then a 5km (3.1 miles) run. A fair bit of training and effort has gone into this one, especially considering that I haven’t swam regularly for donkey’s years! I started swimming on Monday mornings before work back in October. It took me quite a while to get into it, the first time I went, I could only swim 2 lengths (50m) without having to stop for a rest. I gradually built it up, and within a few weeks I was swimming half a mile (800m) in 4 sets of 8 lengths. I set myself a goal of wanting to swim a full mile, 1,600, 64 lengths, non-stop before my birthday in February. This was a bit of a bold goal, so I missed this by a week, but was very pleased with how quickly I’d got up to a half decent distance. After reaching the milestone, I thought it would be an idea to knock back the distance, and concentrate on form and technique, as the two triathlons I’ve entered are shorter distance, the first being today’s pool based 400m swim. This triathlon is a 400m swim, 16 lengths of a “normal” 25m pool, but 12 lengths of the larger 33.3m Robinson pool in Bedford. This is followed by a dash outdoors to get on the bike, ride 24km (15 miles) around north Bedfordshire, then come back to the pool, ditch the bike and do a 5km (3.11 miles) run around Bedford Park. The running training has gone pretty well leading up to the triathlon – I’d ran just shy of 400 miles in 2013 in the run up to the triathlon, although mainly longer distance runs, as I’ve been training with my friend Emma, who ran the London marathon last weekend. I’ve also pretty much ignored speed work for months too – any most of the shorter runs that I have been on have been slow and steady. It turns out that the cycling has been the weak link in this little adventure. I’m a fair weather cyclist – I won’t cycle in the wet, dark, cold, or wind. As a result, I only got out on my bike once between Christmas and the end of March, and that was an attempt to shake of the the New Years Eve hangover. I got back in the saddle in early April, and managed to to put just over 130 miles on the tyres, averaging 15mph. Far from ideal, but it is what it is. I had a feeling that this was going to be an early start, as the race information stated that the registration opens at 6:15. On a Sunday morning? Who even knew that there was a 6:15am on a Sunday?! On Friday night, the swim start times were posted on the organisers website. My start time was posted as 7:37:15. No chance of a lie in then! On the triathlon entry form, they ask for an estimated swim time. Like a lot of other people, I put 11-12 minutes for the 400m swim, so this puts me as one of the slowest. The event is started with the slowest first, so I was to be the 30th person to start. Saturday night soon rolled around, so it was time to pack. 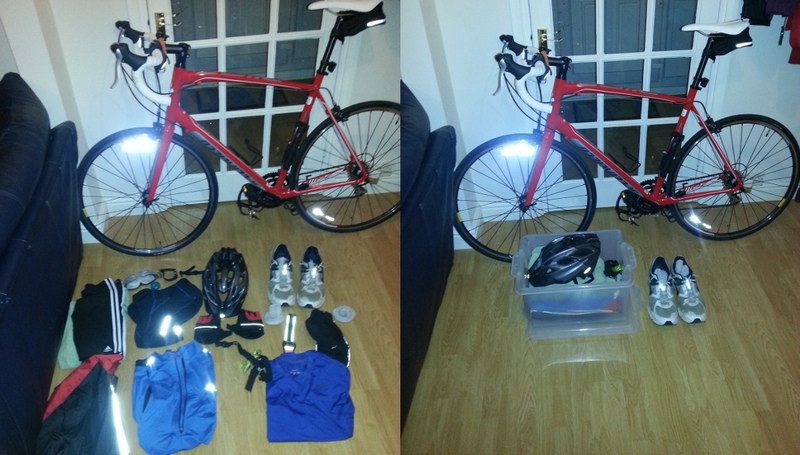 3 sports calls for 3 different sets of kit, and it all has to fit into a transition box. So, goggles, shorts, swim watch and earplugs for the swim. Check. Bike, cycle shorts, compression shirt, jersey, helmet, mitts, socks and shoes for the bike ride. Check. Cap and running watch for the run. Check. All packed and ready to go then! In an attempt to be well organised, I even put the bike rack on the car on Saturday night. I set the alarm for hateful o’clock (5am) for a 5:30 departure. I’d arrange to pick up my shibby mate Stuart up en route, so I crammed a quick bowl of brown flakes and a cereal bar, put the bike on the car. Scraped the ice (!) off the car, and off I went to pick up Stuart. We got to the Robinson pool, which was the race HQ, at just after 6am. The thought of “What the hell am I doing here?” did cross my mind. It was a cold start to the day, and was forecast to be sunny and cool. We registered for the race, collected our race numbers, including being drawn on! 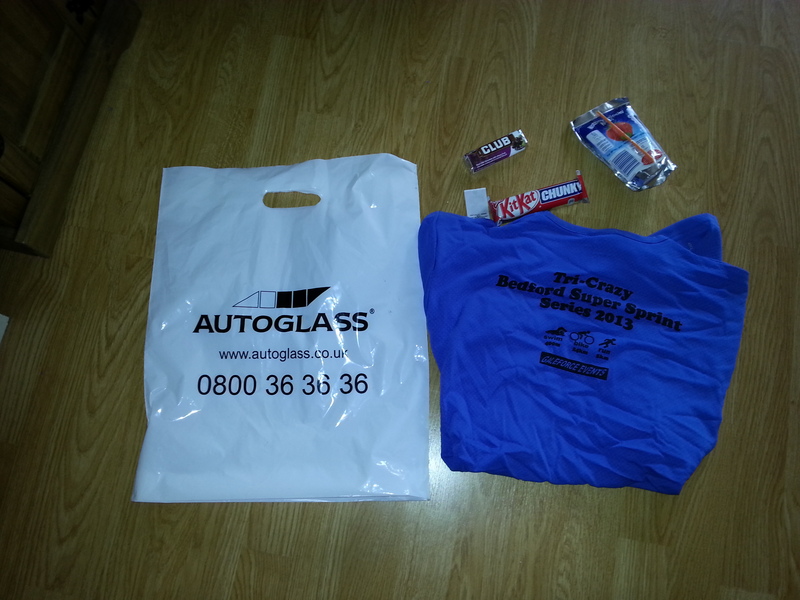 A pretty decent light weight technical t-shirt, a Club, Chunky KitKat and summer berry Capri Sun. I’ll enjoy those later! There were a lot of serious looking bikes there, and a lot of serious looking athletes. 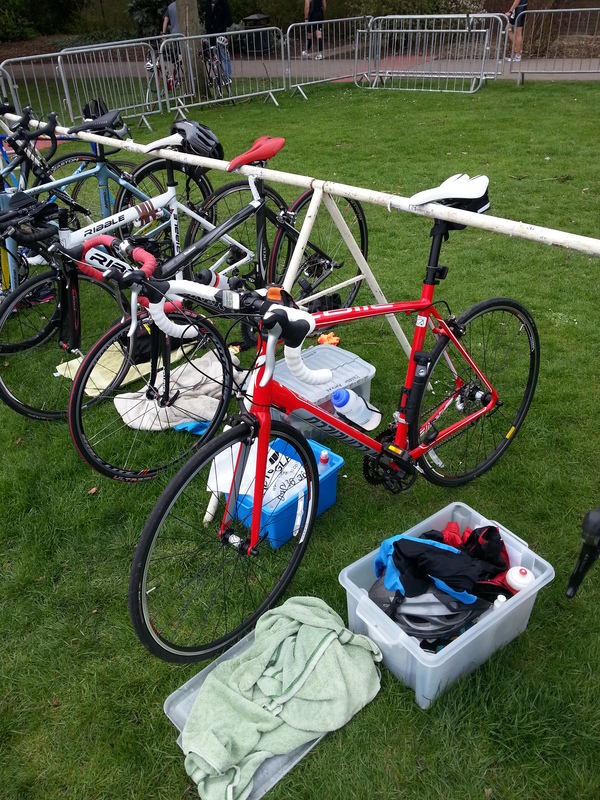 Being my first triathlon, I couldn’t help but feel like a bit of a pretender. There was a race briefing at 7:15, which was a bit of a waste of time, as they were too quiet – they really needed to turn the PA system up a bit. Straight on the back of this, it was time to ditch my running shoes in the transition area with the bike, and tiptoe inside to get ready for the swim. I had to leave my glasses in the transition area too, and have to rely on my prescription swimming goggles to navigate into the pool, and to find my bike after the swim. Unfortunately I didn’t have the right change for a locker, so thought I’d be smart. 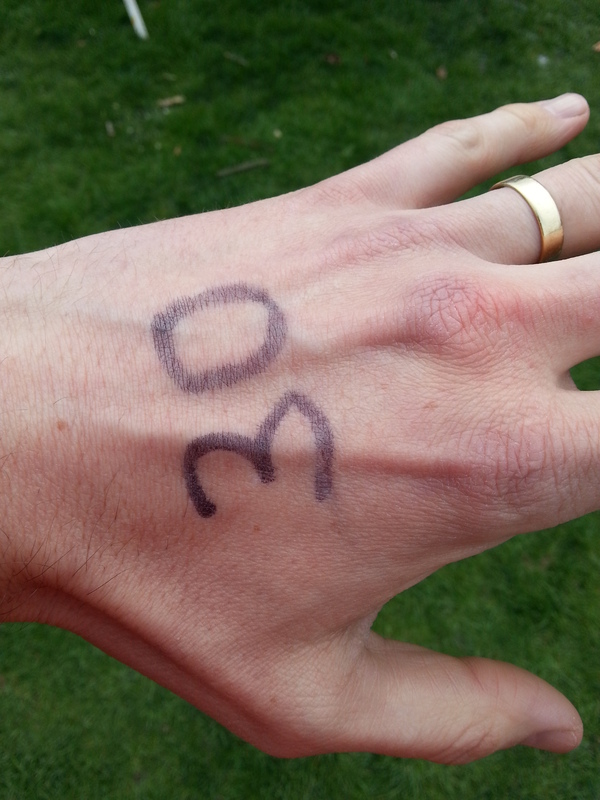 As I was race number 30, I found locker number 30, and stuck my back with tracksuit bottoms and hoodie on top so it would be easier to find later on. I headed to the pool, and lined up for my swim. I got chatting to a couple of people in the line up. Both first time triathletes, which did put my mind at rest a bit. The first swimmers got under way, and they were being started in half length intervals. It’s a very clever system – 2 lengths, then duck under the lane marker, then 2 lengths in the next lane, so start from one side of the pool, and finish the other. It was soon time for me to get in the water and do my swimming. Thankfully being in the slower section, the people in front pace you. The etiquette is that if you want to pass the person in front, you give their foot a tap, then they let you pass at the end. I did have to let a couple of people past me, and I did overtake a couple of people too. 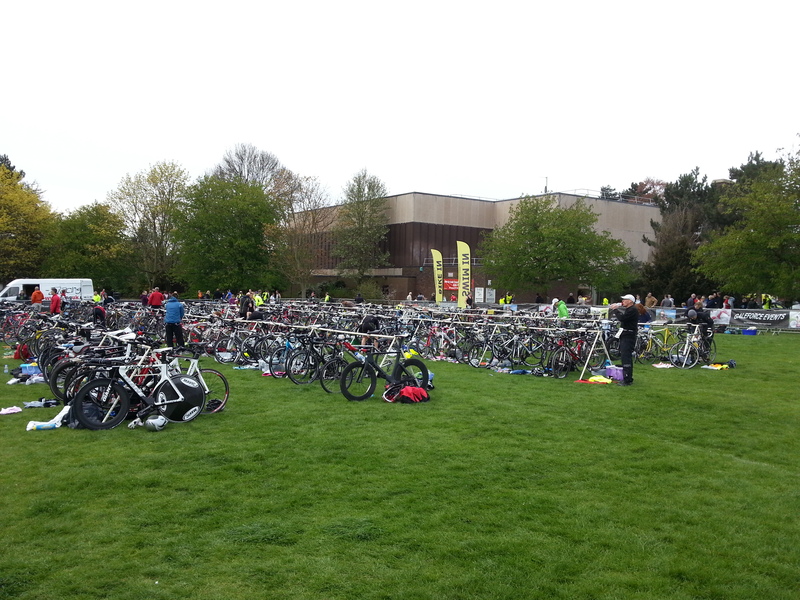 It’s all well thought out, and not nearly as scary as I first thought a triathlon would be. I wasn’t in a particular hurry on the swim leg. I’d never gone from swim to bike before, so was cautious not to tire myself out too much. Apart from getting whacked in the head on the 5th lap by a swimmer coming the other way, the swim went pretty well. According to my swim watch, I was swimming for 9:27, which while I have swam quicker, I was pleased with, as it left me with plenty of energy. I got out the pool, and ran outside, wet and in swimming shorts (brrrr!! ), to go and try and find my bike. Thankfully I found it without issue, and towelled off as quickly as I could, then got my cycling gear on. It’s a push start out of transition, then onto the bike and out into Bedfordshire. There didn’t seems many people out on the bike ride – I was out of transition fairly quickly, so I reckon at most there were 30 people ahead of me on the bikes. But alas, it doesn’t work like that – the results are finished on chip time – the shorter chip time between start and finish wins, simple as that. Anyway, back to the bike. I’ve been trying to keep a nice even pace on the bike, which is easier said than done – it does involve quite a lot of gear changing, but it does seem to be paying off. I am gradually getting quicker on the bike, but it is a slog. The cycle route was an undulating 15 mile ride through north Bedfordshire, which took us out, around a loop, then back to the race HQ again for the second transition. I did overtake a few people on the bike, and I was fully expecting to be overtaken by some of the quicker cyclists, but this didn’t really happen. I was overtaken by a couple, but far fewer than expected. The bike leg was fairly uneventful really. It was uphill in places, and downhill in others. The bike behaved pretty well, although I did clunk the gears in a few places. I think I’d have been quicker over a more familiar route. There were some bendy downhill segments, which I was reluctant to go full blat at, as I wasn’t sure what would be at the turn at the bottom. One point on the outward leg of the bike, we did go down a section of the dual carriageway A6, which was a bit of an experience! I managed to follow the signs, and was back to the race HQ inside an hour, which is what I was hoping for. My own recorded time from my Garmin watch was 55:54 for the bike leg, averaging 16.2mph, so I am pretty pleased with that. Getting off the bike was fun. I had been riding quite hard – probably harder than in training, so the legs were complete jelly trying to run. There was about 100m to cover pushing the bike to transition. This was a kind of run/walk/run effort. I was egged along by the crowd at this point – a good few people had come out to Bedford park to support the triathlon, which gave me a real boost. I put my bike back on the rack, took my mitts and jersey off, and swapped the helmet for my running cap, and tried to work out where I was going. I did have to ask for directions how to get out of transition, which was a little embarrassing. I did have a bit of a mess up with my watch at this point, I didn’t quite manage to press the “Lap” button to tell the watch that I had finished in transition and started the run, but never mind. The run part of the race was 2 and a half laps of Bedford Park. I’ve never been to Bedford Park, and it seems very pleasant. The do a weekly Parkrun, which is the same route. It’s a weekly, free race every Saturday morning. I’ve been meaning to run it, perhaps I will now. I generally hate running laps, as I find passing the start so very demotivating. Today was OK though. It’s nice and flat, and the first lap went very well. 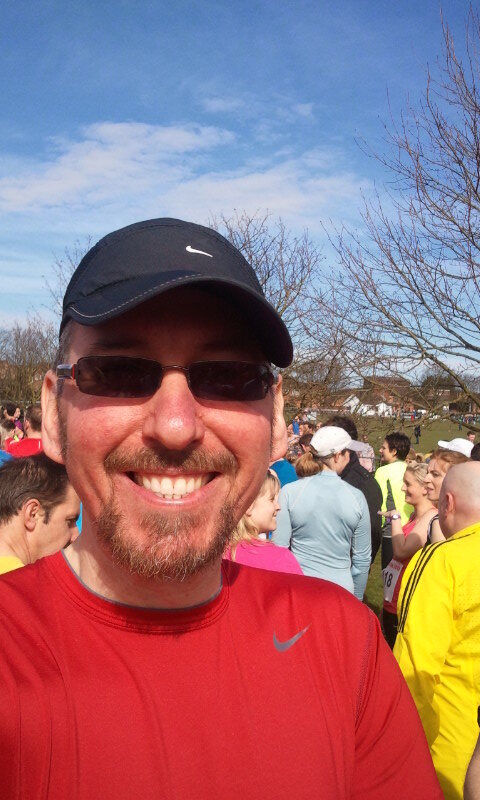 My 5k PB is 24 minutes odd, and I knew there was no danger of worrying that today – the run leg of a first triathlon isn’t really the time or the place to be looking for a 5k PB. I’d have been absolutely chuffed with anything under 30 minutes. I was surprised to see that I completed the second lap in about 20 minute, so felt like I was running well. I cracked on, and even managed to speed up a bit – I didn’t want anyone to get ahead of me! I’m not normally remotely competitive, but for some reason, today I didn’t want to give up any places. I completed the final half lap, and stopped my watch, and it said 25:08, but I knew this wasn’t right, as I fumbled the buttons a bit. I’d have to wait for the official results for the actual accurate split times. Unfortunately, there was a bit of a “technical issue” with the timing. For some reason, they didn’t record all of the times everyone crossed the chip mats. Normally, you’d get a full break down of swim time, T1 time, bike time, T2 time, run time, and total time. All the total times were recorded accurately, my complete time was 1:37:46. The official swim time was 9:58 and the official run time was 27:05. There was no official times for the transitions or bike leg. Thankfully I had my data off my watch, and I knew that my bike time was 55:54, and I could calculate the T2 based on my bike and run start and times. The remainder would be my T1 time. They might be a little bit rough, but close enough for me at my level. My final position was 216 out of 274. I was worried about coming last, dead last, but it seems like that anxiety was misplaced. I’m generally very happy with my triathlon debut. I was very apprehensive leading up to this, but thankfully it’s been filed as “fear of the unknown”. I had in mind that the race would be full of the elite, and the snobbery that I perceive goes along with it, but I couldn’t have been more wrong. Everyone I spoke to was very friendly, from the newbies like me, right up to the seasoned professionals on £5,000 bikes. But that’s the thing I suppose – were the blokes on the £5,000 the elite, or blokes like me with a bit more cash to splash out on an expensive bike? A bike worth more than my car doesn’t make a triathlete – it might help at the top end, but it wouldn’t make a lot of different to the middle or the back of the pack where I sit. So would I do another triathlon? YES! A million times yes! I loved every minute of it! I may be a very average swimmer, cyclist, runner, and triathlete, but then so is the bulk of the competitors. I’m never going to win any races, but I’m going to turn up and enjoy the process anyway! This was the second time of running this race. The first time was last year, as part of my marathon training. Not many marathon training plans feature a 10k race 2 weeks before the marathon, but we won’t go into that too much. This year, I’ve been doing quite a lot of long distance running, as I’ve been helping my friend Emma with her marathon training. I’ve not really done any speed work or anything to specifically help with the 10k pace. I’d also had a busy few days of training – in the last 10 days, I’d ran 5 times, cycled 3 times, and swam. As well as training with Emma for her marathon, I’m also training for my first triathlon, so all the multi sport stuff is taking its toll a bit. I did have Friday and Saturday as rest days, so that probably helped. Anyway, back to today. The race was starting at 10:30, and pretty local, so I arranged to pick Tom up at 9am. 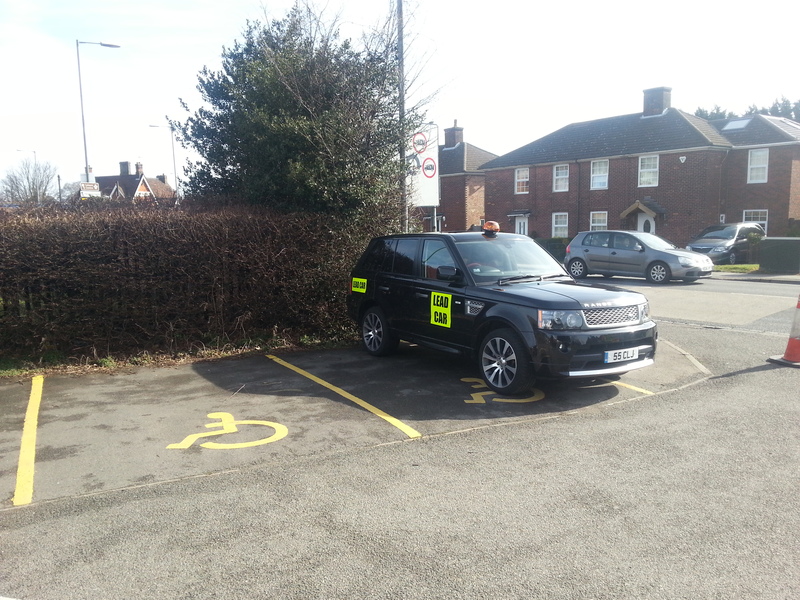 After breakfast of Nutella porridge, a strong black coffee, and a pint of water, I headed off, and we arrived in Flitwick and parked up. There was a bit of a walk to race HQ, but we got to the start in plenty of time. We collected our race numbers and chips, and mooched about a bit. The weather forecast was 15-16C with strong winds – 45kph (28mph in old money), which isn’t great. This is quite a contrast in temperature to recent weather – most of my training this year has been sub-zero. This was the first run of the year in shorts and t-shirt, and felt like I’d left a layer at home! It was nice for the sun to be out. I’m still waiting for my sponsorship cheque to come through from Nike by the way. It was soon time to make our way to the start of the race. We put ourselves quite far back, but there were no pacers, so it was difficult to know place ourselves in the pack of about 1,000 runners. We didn’t want to be too far forward and get in the way, and get overtaken a lot, as that’s annoying and demoralising. But at the same time, too far back, there’s a chance of getting stuck behind slower runners. I think we got it almost right, but were quite far back, so did spend a lot of time over taking people. The klaxon went off promptly at 10:30, and we were off! The wind didn’t seem too bad at start. I think we must have had a tail wind for a bit, because when we turned, it felt like a real cross wind. We ran the first mile in 8:35, which is pretty quick for me at the moment. We jostled for position, and the first mile ended up being slightly downhill, and managed to find a bit of space to run at out own pace. Mile 2 slowed a little, to 8:43, and was generally up hill. Mile 3 was slower again at 8:49 and was anything but flat. The downhill seemed just as hard as the uphill! We’d soon passed the 5k halfway marker, in about 27 minutes dead. This wasn’t looking great – races are normally slightly over distance, and I very rarely manage a negative split, where the second half of a race is quicker than the first half. 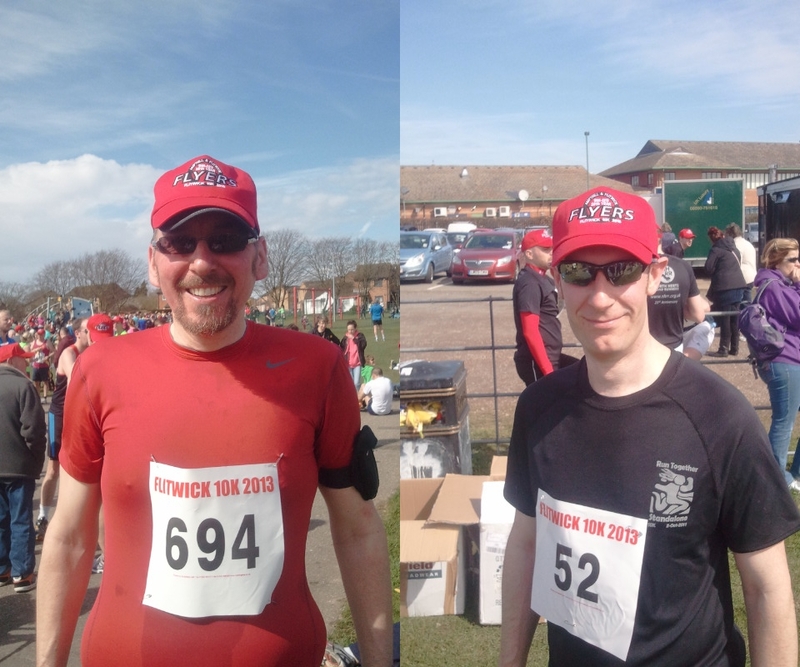 I was after a personal best today, my previous best 10k time was 54:33 from this race last year, so it was looking like it was going to be tight. 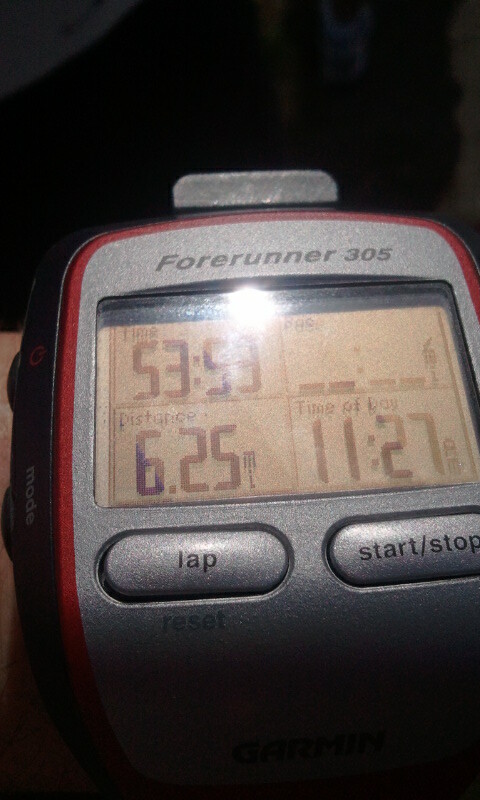 I managed to speed up slightly, and miles 4, 5 and 6 were 8:37, 8:42 and 8:35 respectively. My Garmin beeped at the 6 mile mark, and I looked down, and saw it read 52:05. 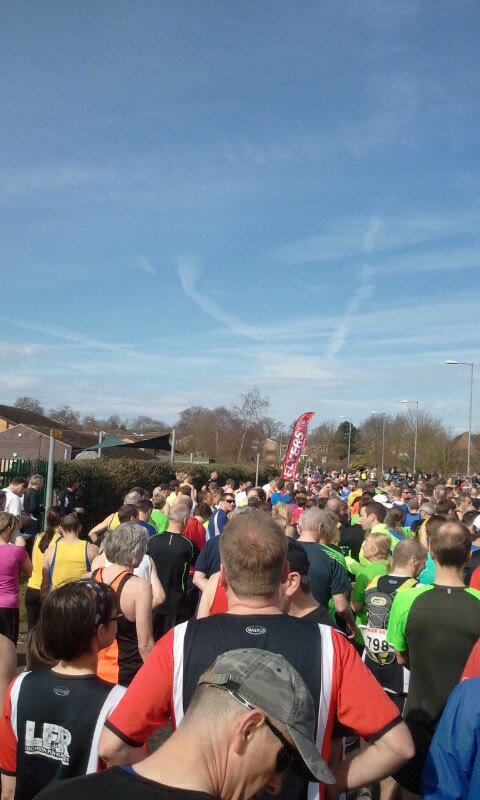 I realised I might be on for a PB – the last .22 of a mile in a couple of minutes. Bring it on! I managed to kick a bit of speed through my legs. The last .22 of a mile was actually .25 of a mile, but I managed to run it in 1:49, which was a pace of 7:19 a mile! Final time 53:53, according to my watch! A PB of 40seconds of last years race. 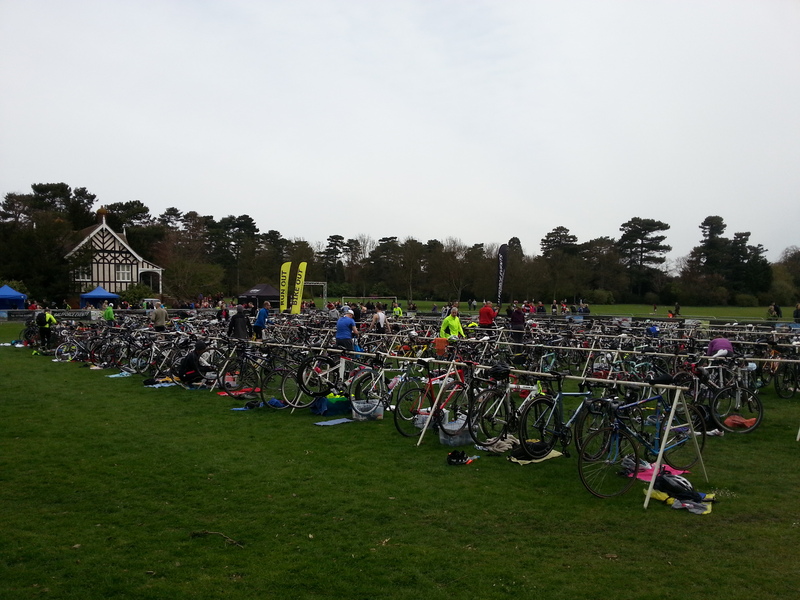 Next race is the Bedford Sprint triathlon on 28th April – 2 short weeks! Eek!